After much delay due to other projects I finally got a chance to put together a Rostock delta printer. My build log is below, I have made a few minor changes compared with the original design in order to use 3mm filament and incorporate a few good ideas I saw on thingiverse and various blogs. Here is a bit of video to give an overview of the printer in action - printing the first print, a dual spiral lightbulb. As you can see from the video I now need to work on the speed and retract settings to improve the quality and reduce the stringing. 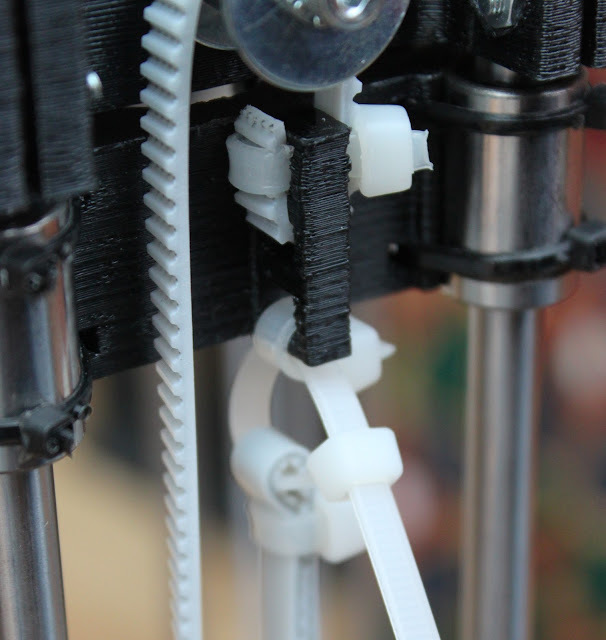 I initially printed the standard Rostock parts from thingiverse, but a common suggestion is to change to fibreglass or carbon fibre rods so I decided to change to carbon fibre rods with the Traxxas rod ends. Half way through the build I switched to 0xPIT's version of the end effector platform which is designed specifically to mount a J Head hotend with minimal issues that works well with Traxxas rod ends. I used nophead's version of the Wades extruder rather than the Rostock standard extruder as I am familiar with these extruders and I want to use 3mm filament. 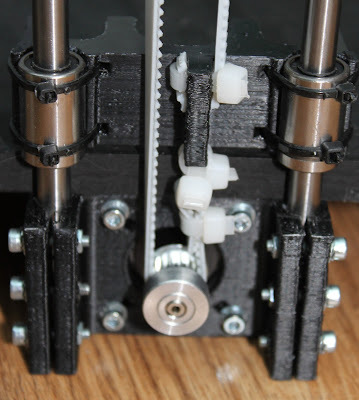 In the future I may look at changing the gear ratio to balance speed and torque as shown on Billy D's blog, which is an excellent source of Rostock printer tips. I used 10mm plywood and marked out the drill holes using measurements from this thing and checked them with the printable jig. After drilling I painted the top and bottom boards before mounting the motor and idler ends. Other than for the inner motor mount fixings I used wood screws through the plywood into the plastic parts which cut their own thread into the plastic. The rods were cut to the same length and aligned at the bottom of the motor ends and top of the idler ends but precise alignment is not critical as the endstops are adjusted during calibration. At the idler end I used 2x624 bearings with various washers (similar to the X and Y axis idlers on the Mendel90).These are mounted on an M4 bolt - the one in the picture is a little long, however M4x40mm should work well. I adapted the idea from Frank Neon's blog pictures to use zipties to hold and tension the belt. The adaptation keeps the zip tied section short to avoid fouling on the stepper drive gear even when the carriage is at its lowest point. Before tightening the pulley's grub screw, move the carriage to the bottom of the axis to aligh the pulley to the belt. To help stiffen the frame two wooden sides are added. I used the printed Mendel90 fixings to secure these. The Traxxas rod ends have an ID of approximately 3.5mm which I drilled out to 4mm to fit the 4mm carbon fibre rods. As suggested in a number of places I used a wooden jig to ensure all the rods were the same length. The ends of the carbon fibre rods needed to be lightly sand papered to fit into the 4mm holes, a thin layer of super glue holds them in place. Below is a picture comparing the carbon rods with Traxxas ends to the original printed rods. Next I fitted the rods to the carriages and the end effector platform. After wiring the motors and endstops up as per the wiki page, I attached a Dial Test indicator for calibration. Using the calibration guide here to level the end effector platform to the bed, It took a number of iterations but by the end there is less than 0.05mm difference between the Z "0" position in front of the three axes and the center of the bed. I then replaced the DTI with a JHead hotend and connected the PTFE bowden tube (4mm ID, 6mm OD). The long nut shown below threaded the tube and grips well but I will probably replace this with a push fit connector at each end. The JHead is wired up as standard with the wiring wrapped around the bowden tube. To hold the PTFE tube at the other end I used the Bowden Clamp for Rostock. Zipties did not appear strong enough so I replaced them with a Jubilee Clip. After calibrating the E steps per mm I started the first print. Overall the build time was a little over 8 hours work (spread over a few days), including taking pictures and searching for information. 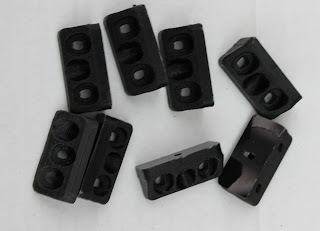 One of the advantages of the Rostock is the reduced part count and simpler assembly in comparison to the Prusa Mendel. Experiment with retraction and speed settings to improve print quality. Confirm dimensional accuracy across the build area. 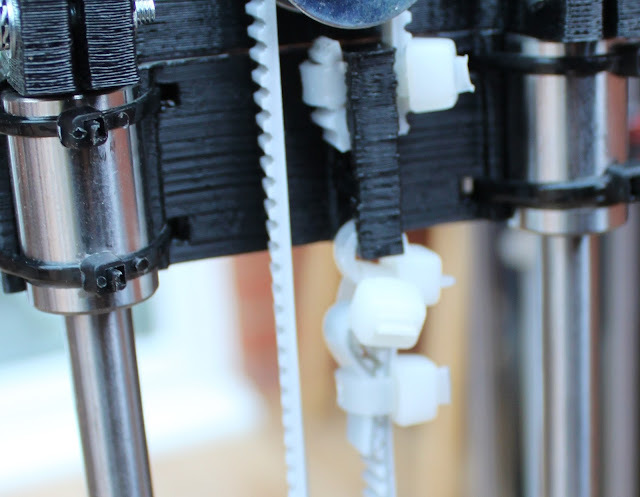 Mount a fan for extruder cooling to print PLA. Replace the current bowden cable ends with push fittings. Experiment with various extruder mounting locations. Multiple hot ends for multiple colour printing. Tks for sharing your build details. I'm wondering why you went with 3mm filament? I'm a fan of 3mm from a cost effectiveness perspective, but will it prove more of a challenge with the Bowden rig? 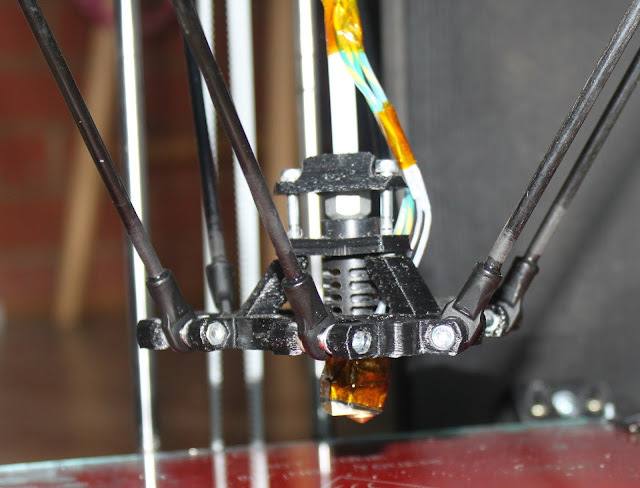 By the way, in case you haven't caught it, the recent release of Sli3er (0.9.9) has been "optimizations for printers with Bowden extruders", with a promise of even more Bowden directed enhancments. Let us know how the testing goes. I imagine 3mm filament may prove more challenging - but I need to do more experimenting (and also try 1.7mm filament as a comparison). I went with 3mm filament because all our other printers use this and I would prefer not to source multiple filament sizes. I will write more once I have a chance to do further testing. Wath controller and driver did u use? I currently use a Sanguinololu with the Panelolu controller on the rostock. Have you got a panelolu2 display working on your delta printer. I can't get Johanns build of marlin to compile with the panelolu2 support switched on. I have mine connected to a printrboard, all compiles fine till i activate panelolu2 support. I have an original Panelolu working fine with this but not the I2C Panelolu2 (that pauses during the print very briefly, even when printing from SD - which I think is due to processor overload). That said I have not had a chance to play with the Rostock in quite a while and a newer version of Marlin may better. The most recent Marlin has support for I2C LCD displays including the Panelolu2 along with Delta bots.